The Millenium Cross is a large 60-foot cross built as a reminder of the millennium, the birth of Our Lord and of the Eucharistic Congress of 1932. It’s made of stainless steel, is over four tonnes in weight and is located on Cloneybrien Hill near Portroe, Co Tipperary. It’s just off the Ballina-Portroe road. The Cross replaced a stone cross built for the Eucharistic Congress of 1932, which was destroyed by lightning in 1945. 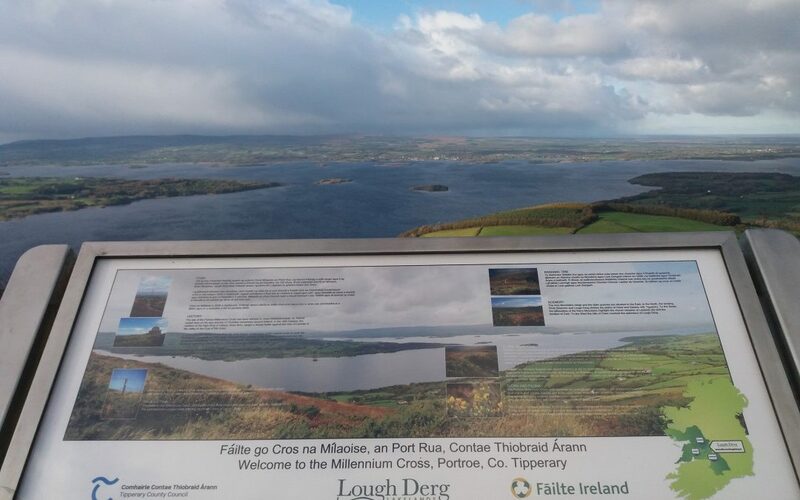 There are magnificent views over Lough Derg & the River Shannon and many surrounding counties. The Twelve Pins and Maamturk Mountains of Co Galway can be seen on a clear day. Less than a half hour from Clareville House and well worth a visit.!! !